While many veterinarians choose to work as associates within an established practice, some do decide to venture out on their own and build a new practice from the ground up. Starting any business can be a difficult task, but with careful planning, the process can run quite smoothly. Here are some tips for starting a new veterinary practice. Creating a business plan should be the first step in the planning process for any business, whether it is animal related or not. The business plan should detail many topics including the type of clinic you intend to operate, the size of the operation, staffing needs, services that will be offered, marketing plans, funding sources, financial projections for the next three to five years, and other such considerations. You will need to secure the services of a team of professionals to open a veterinary clinic. Most vets seek out an accountant, an attorney, a real estate agent or architect, a financial lender, and a marketing representative. Securing financial backing is a key part of establishing any business. A small animal clinic can cost approximately $1,000,000 to start (according to a 2009 article in Veterinary Practice News), a substantial investment for most business owners. Your funding could come from your own savings, but with veterinary student debt levels growing at an unprecedented rate most young veterinarians do not have the ability to self-fund. Other sources of funding may include family, friends, investors, and professional lenders. The next question is whether you will operate out of an existing building (potentially with some renovations required) or construct a new facility from the ground up. Each option has its pros and cons. You also must decide whether to lease or purchase the clinic location. Some vets choose to consider more affordable options such as mobile veterinary clinics to save money on location expenses. You should also research any applicable zoning or noise ordinances before making an offer on a property. A final consideration is ease of access for your client base with regard to a convenient location with sufficient parking capacity. A real estate agent or architect can be very helpful with this process. Veterinarians must apply for federal and state narcotics licenses for drug dispensation. They must also comply with OSHA rules, pay all state board fees, obtain a business license to operate in their local jurisdiction, and secure a tax identification number. Specific requirements can vary, so it is important to research the requirements in your area. Creating a marketing plan is a key step in the process, and many vets enlist the help of marketing professionals to assist with this task. The first step is to name the business and create a signature logo. The name and logo will be critical for all advertisements, building signage, and the website. Vet clinics should also consider using social media accounts, direct mail advertising, local magazine advertisements, radio or TV coverage of the clinic’s opening, and network with other animal businesses for referrals. Once the location is secured and all necessary permits acquired, the clinic needs to be outfitted with a variety of supplies, medical equipment, laboratory instruments, and drugs. Some clinics also choose to offer pet food, pet supplies, and other over the counter items. 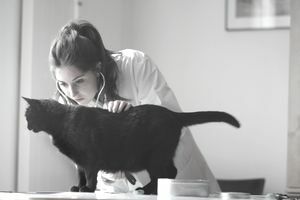 Hiring employees can be an exhausting process for the veterinarian, so some choose to use the services of an employment agency to screen applicants (there are many veterinary job search websites that can advertise openings as well). The vet has to determine the number of veterinary technicians, receptionists, and other support staff based on what they can afford and the expected workload. They must also decide whether they will have a veterinary practice manager, kennel attendants, groomers, or other accessory team members. Once everything is in place, the final step is to open the doors and make sure that members of your community know that you are open for business. If a good marketing plan is in place you should be well on your way to establishing a successful practice.